Here’s the thing about baking pies for me. I just haven’t baked very many of them before. For junior bakers like myself, the idea of having to make the pie crust – dough, rolling and all – can seem a little over-whelming. I’m still trying to make sure that the inside of the pie tastes good. I don’t want to compound the issue by having to worry whether or not my crust is flaky enough (or too flaky). That’s why I’m a fan of pre-made pie crusts. And since I like to eat healthy when I can (or at least pretend like I’m healthy…when I’m making pie) Wholly Wholesome’s Organic 9″ Pie Shells are a great solution. 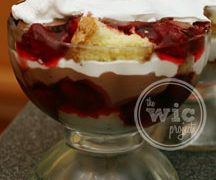 Dessert is a fun item to make but sometimes the thought of making pastry from scratch is too much for busy lifestyles. We have the perfect solution – use Wholly Wholesome Organic Pie shells as your dessert base (or top!) and get creative with your fillings and toppings. Lemon Meringue, Apple Streusel, Quiche Lorraine all seem so much easier to complete when the pie shells are there in the freezer waiting patiently to be created into something delicious. 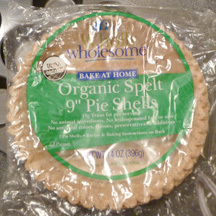 Wholly Wholesome Organic 9″ Pie Shells are pre-made shells that you keep in your freezer until you’re ready for cooking. The pie shells come in three varieties, each of which is USDA Organic – Traditional, Whole Wheat, and Spelt. (By the way, in this instance “spelt” is not the past tense of spell, it is actually referring to a type of wheat.) What’s so great about these shells is that in addition to being organic, they have 0g of trans fat, no artificial colors, flavors, preservatives, or additives, and no animal ingredients. Basically, we’re dealing with wholly wholesome stuff here. Ever up for a pie challenge (Top Chef Just Desserts – here I come!) I decided to bake up two never-before-made-in-my kitchen pies using the Wholly Wholesome Pie Shells. First up was a chocolate creme pie using the Wholly Wholesome Organic Spelt Pie Shells. Sadly, the chocolate creme filling wasn’t that good. But, the saving grace of the pie was that the shell was quite tasty. It seemed to provide a hint of sweetness and texture that the pie filling itself was lacking. Score: Pie filling 0, Wholly Wholesome Pie Shell 1. 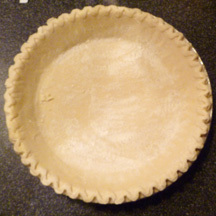 The next item up for testing was the Wholly Wholesome Traditional 9″ Pie Shell. 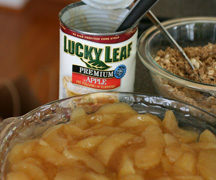 The test recipe – Apple Crumb Pie. Here’s the thing about apple pie and me. 99.9% of the time, I only like eating the insides of the pie. While the crust could taste fine, the apples were what I craved. For the first time in baking history (or at least my baking history,) I actually liked the pie shell more than the apples. And the apples were already pretty good, so that should tell you that the Wholly Wholesome Traditional Pie Shell was MORE than good. The way that it soaked up the apple flavor, yet still had a tasty “crust” flavor with just a hint of crunch to it was totally perfect. Score: Pie filling 0, Wholly Wholesome Pie Shell 2. In the battle of my pies, Wholly Wholesome Pie Shells outshined (or is it outshone) the pie fillings in terms of tastiness and overall good eats. They are a wholesome and easy way to bring your pie baking to another level. Check them out in the freezer section of your local natural products store (like Whole Foods) or in the natural foods section of your grocery store. If you’re feeling like a cooking challenge, and want a chance to win a KitchenAid Countertop Mixer, then pick up some Wholly Wholesome pie crusts or shells, get baking, and then send them your winning recipe for the Wholly Pie! Recipe Contest! The contest ends on April 15th, so you still have plenty of time to mail in your favorite recipes. Three readers will receive a coupon for FREE Wholly Wholesome products! This giveaway ended on March 15, 2011 and is now closed. I would use the Original Traditional. So glad to learn about this product. I don’t always have time to make my own crust and must use store bought. I am using one for tonights strawberry pie and I would rather not think about the ingredients. The ingredients sort of erase all the benefits of a low/no sugar fruit pie. Great product! Chocolate Pie Crust and put cherrys and custard in the middle. I would use the whole wheat pie shell to make sweet potato pie! I’d use the graham cracker crust to make a banana cream pie. I’d like to try the Organic Traditional and would bake an apple pie. I would get the wholly traditional pie shell and back a pumpkin pie! 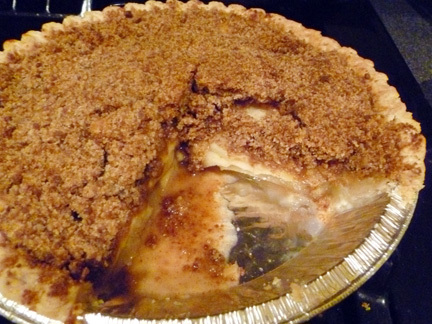 “Like” Wholly Wholesome on Facebook -pamela j.
I’d like to make an apple pie with their Organic Traditional 9″ Pie Shells. 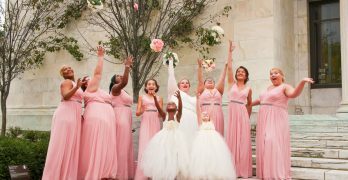 I’m a facebook fan of Wholly Wholesome under username Jennie Tilson. I would use the Wholly Traditional pie crust to make grasshopper pie. I would use the traditional pie shell to bake a pumpkin pie! Chocolate Pie Crust with french silk pie filling.